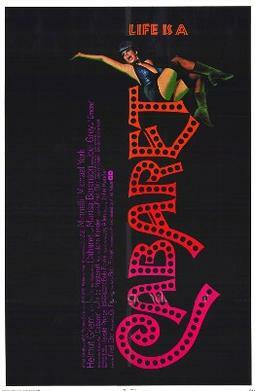 This weekend the family sat down to watch Bob Fosse's 1972 film Cabaret, adapted from the famous 1966 musical by John Kander and Fred Ebb. It was a first time for all of us: my wife hadn't seen it, nor had my son, and I had only seen a heavily edited-for-television version in my youth — or so I thought. I had, however, read Isherwood's Berlin Stories, one of the fictional inspirations for the musical, and some histories of the era. Our reaction: baffled disappointment. It wasn't a very entertaining musical, it wasn't a very interesting depiction of Weimar-era Berlin, and none of us ever gave a damn about the characters. When a legendary choreographer and musical director like Bob Fosse films a movie based on a long-running hit Broadway show, you expect some amazing dance and music numbers. But . . . the movie cut out half of the stage show's songs, and the dance numbers are all staged in a basement nightclub which looks about the size of Bob Fosse's living room. The dancers can't do much but shimmy and pose in place. Now, I don't need every number to look like Cab Calloway and the Nicholas brothers, but it's odd that Fosse — of all directors — chose to focus on the drama of the frame story at the expense of the musical elements. This focus is especially weird because the talking-and-dramatic parts of the movie aren't very interesting. Fosse had Weimar-era Germany to work with and wound up making a movie that was pretty tame. I thought I had only seen the PG-for-TV version, but I was wrong. That was the whole film. There is no shocking Berlin decadence. Some girls wear slightly revealing outfits, a dude dressed as a chick uses the urinal next to Michael York in the bathroom, and Joel Grey wears false eyelashes and makeup. Oh, and Michael York's character is gay, sort of. Christopher Isherwood, who wasn't "sort-of" gay at all, described the decadence of Weimar Berlin, which he observed first-hand, as "nauseating." Icons of the era were people like Anita Berber or Marlene Dietrich. Dietrich's The Blue Angel is a hell of a lot more authentically decadent than the Sixties posers in Fosse's film. Even Joel Grey's Master of Ceremonies isn't as cruel or sleazy as he should be. The Kit-Kat Club and the Berlin rough-trade gay scene should be nightmarish, so that when the characters go hang out in a rural beer garden and a fresh-faced kid starts singing "Tomorrow Belongs to Me" the audience should feel a sense of relief and hope . . . right up to the moment when he puts on his Hitlerjugend cap. Finally, I have to say I couldn't believe the main characters. Michael York plays his character as rather aristocratic and very comfortable in himself. We never really see that his main reason for coming to Berlin is to hook up with anonymous male partners, or that he feels any sense of self-loathing for doing so. The only man we do see him sexually involved with is a nice, well-scrubbed young aristocrat — what a charming place Berlin seems! And Liza Minnelli is utterly wrong as Sally Bowles. Sally's the embodiment of her era, and is heading for an equally apocalyptic end. She needs to be more obviously self-destructive, a true addict who gives up everything for the next fix. Liza-as-Sally comes across as far too down-to-earth and resilient, a jolly 1970s party girl having a bang-up time. Nothing a stint in rehab won't patch up. So . . . now I'm looking for a better movie about Berlin between the Kaiser and the Fuhrer. It's an incredibly rich period for storytelling. Any recommendations?